The 21st issue of the Islamic State’s weekly Al Naba newsletter, which was released earlier this month, contains an infographic (seen below) that says much about the organization’s operations inside Libya. The image purportedly summarizes “the most important military operations” against the “apostate Awakenings and the Libyan Army” in the city of Derna during a three-month period that ended Feb. 29, 2016. A map at the top of the infographic highlights four key cities along the Mediterranean coast. From west to east they are: Sirte, Benghazi, Derna and Tobruk. Sirte has fallen to the “caliphate’s” fighters, who also control the neighboring towns of Nawfaliyah and Bin Jawad. In Benghazi, the Islamic State’s arm most likely cooperates, tacitly or otherwise, with other jihadists against General Khalifa Haftar’s forces in the Libyan National Army. But the story in the eastern city of Derna has been different. Abu Bakr al Baghdadi’s followers have repeatedly fought their jihadist rivals in the Mujahideen Shura Council (MSC) and other aligned factions since last year. The MSC has received the backing of al Qaeda in the Islamic Maghreb (AQIM) and has noteworthy ties to al Qaeda’s international organization. The Islamic State refers to the MSC and allied organizations as the “apostate Awakenings.” The term “Awakenings” was once reserved for the Islamic State’s tribal opponents in Iraq, but the “caliphate” has broadened the meaning of the term to include even those organizations affiliated with al Qaeda. Al Naba notes that the entirety of Derna falls under the jurisdiction of the Wilayat Barqah (or its eastern Cyrenaica Province). But the Islamic State’s “soldiers” are based in Al Fatayih (an area in the eastern part of the city) and its surrounding areas, as opposed to the heart of Derna. This is due to the group’s battles with the MSC last year. The Islamic State’s men were forced to abandon their strongholds in Derna’s center for the outlying neighborhoods. According to the statistics in Al Naba’s infographic, however, the Islamic State continues to battle its jihadist foes. Its snipers targeted the “apostate Awakenings” 15 times and the group also detonated 32 improvised explosive devices against them as well. The “caliphate’s” soldiers launched 7 commando operations. In sum, Al Naba’s editors claim that 250 members of the “Awakenings” and the Libyan Army were killed or wounded, four tanks and 18 other military vehicles were destroyed, and five military outposts were overrun. In addition, several vehicles were captured, along with a variety of other weapons and ammunition. The Islamic State does not break these figures down further, so there is no way to tell how the alleged casualties were distributed between the “Awakenings” and Haftar’s forces. 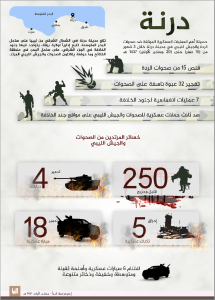 These statistics cannot be independently verified, but Al Naba’s infographic highlights the ongoing fighting between the Islamic State’s Libyan arm and its jihadist foes. IS HAVE RIVAL GROUP IN LIBYA AND FIGHT AGAINST HIM. Libya — Obama and Hillary’s greatest foreign policy achievement yet no one holds them accountable.